Though it is often attributed to the Dutch artist Leyden, “Les Patineurs” tapestry is actually the work of the artists and weavers of the Gobelin’s manufactory from France. First woven in 1770, the work’s inspiration came from a number of artists whose style was improved upon by the manufactory’s own staff. This Gobelins tapestry scene is a close-up version of the larger “Les Patineurs”, which literally means the skaters. The family is enjoying a brisk day by the frozen lake. Behind, couples are skating on the ice near the village where they live. The original work can still be seen at Elysee Palace, used by the president of France to entertain foreign dignitaries. This reproduction is a detail taken from the original “Les Patineurs”. 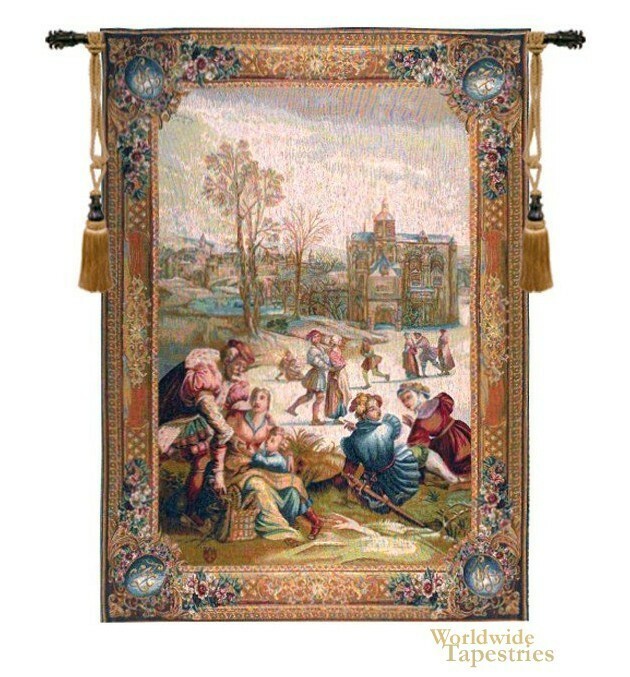 This Gobelins French art tapestry is lined and has a tunnel for easy hanging. Note: tapestry rod, tassels, and accessories, where pictured, are not included in the price.